Interpreting dreams is difficult because we aren’t used to their symbolic language. Dream images are linked together in a way that is often quite foreign to a linear way of thinking. One of my own more memorable dreams was of a spider on skis, balanced on a razor blade, racing down an Alpine slope. Apparently the unconscious has a sense of humour. 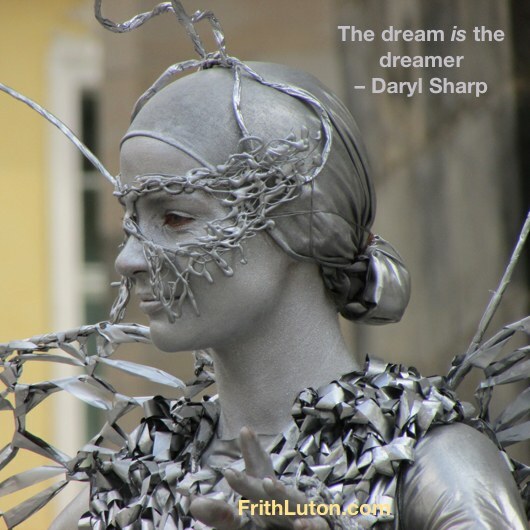 In other words, the dream is the dreamer. Each element in a dream refers to an aspect of the dreamer’s own personality, which means that the people in our dreams are personifications of our complexes. More: dreams show our complexes at work in determining our attitudes, which are in turn responsible for much of our behaviour. Doing the work required to understand the message of a particular dream or dream series is one way to de-potentiate complexes, because through this focused attention we establish a conscious relationship to them. However, our own dreams are particularly difficult to understand because our blind spots—our complexes—always get in the way to some extent. 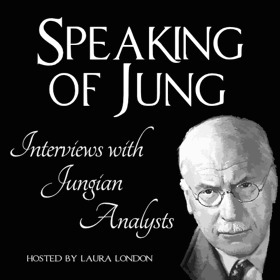 Even Jung, after working on thousands of his own dreams over a period of fifty years, confessed to this frustration. Contrary to popular belief, interpreting dreams is virtually impossible without the dreamer’s cooperation. You need a thorough knowledge of both the context—the dreamer’s real-life situation at the time of the dream—and the dreamer’s conscious attitude. These, and personal associations to the images in the dream, can only come from the dreamer. If the essential purpose of a dream is to compensate conscious attitudes, you have to know what these are or the dream will forever remain a mystery. The exception to this is archetypal dreams. These are distinguished by their impersonal nature and the presence of symbolic images and motifs common to myths and religions all over the world. They commonly appear at times of emotional crisis, when one is experiencing a situation that involves a more or less universal human problem. They also tend to occur at times when a new adjustment or change in the conscious attitude is imperative, and particularly at periods of transition from one stage of life to another, such as puberty, marriage and midlife. In this category are dreams of natural disasters: earthquakes, hurricanes and other catastrophic, end-of-the-world images. Only the psychologically naive take these to the streets proclaiming an impending apocalypse. The rest of us look to ourselves. What earth-shattering change is afoot in me? What is rocking my life? What is there about my attitude that the unconscious is unhappy with? There is no fixed meaning to symbols or motifs in dreams, no valid interpretation that is independent of the psychology and life situation of the dreamer. Thus routine recipes and definitions such as those found in traditional “dream dictionaries” are of no value whatever. Nor are exercises aimed at controlling or manipulating the content of dreams, as some claim to do. There is no convincing evidence that this is possible, nor would it be desirable even if it were, for one would thereby lose valuable information about oneself that is not available otherwise. Many dreams have a classic dramatic structure. There is an exposition (place, time and characters), which shows the initial situation of the dreamer. In the second phase there is action, a development in the plot. The third phase is the culmination or climax—a decisive event. The final phase is the lysis, the result or solution of the action in the dream. It is often helpful to look at the lysis as showing where the dreamer’s energy wants to go. Where there is no lysis, no solution is in sight. The best way to work on one’s dreams is in a dialogue with another person, preferably someone trained to look at dreams objectively and therefore less likely to project his or her own psychology onto their images. Of course, even some knowledge of one’s own complexes is no guarantee against projection, but without training of some kind both parties are whistling in the dark. The first step in interpreting dreams is to get the dreamer’s personal associations to all the images in it. If there is a tree, say, or a rug or a snake or apple, it is important to determine what these mean in the experience of the dreamer. This takes the form of circumambulating the image, which means staying close to it: “What does an elephant mean to you?” … “What else?” … “And what else?” This is quite different from the traditional Freudian method of free association, which may eventually get to the complex but misses the significance of the image. On top of personal associations to dream images there are often relevant amplifications—what trees or rugs or snakes or apples have meant to other people in other cultures at other times. A knowledge of archetypal images and motifs serves to broaden conscious awareness by bringing in material that is not personally known but is present in the unconscious as part of everyone’s psychic heritage. Garnering personal and archetypal associations to a dream, and its context in the dreamer’s waking life, is a relatively simple procedure. It is necessary, but only preparation for the real work—the actual interpretation of the dream and what it is saying about the dreamer’s conscious attitudes. This is an exacting task and an experience so intimate that the interpretation of any particular dream is really only valid for the two persons working on it. In general, dreams may be interpreted on a subjective or an objective level, and sometimes both are relevant. The former approach considers a dream strictly in terms of the dreamer’s own psychology. If a person I know appears in my dream, the focus is not on that actual person but on him or her as an image or symbol of projected unconscious contents. Where I have a vital connection with that person, however, an objective interpretation may be more to the point; the dream may be commenting on a significant aspect of our relationship. In either case, the image of the other person derives from my own psychology. But whether a subjective or objective approach is more valid, or some balance in between, has to be determined from the context of the dream and the personal associations. That is the work of analysis. Dreams invariably have more than one meaning. Ten analysts can look at a dream and come up with ten different interpretations, depending on their typology and their own complexes. That is why there is no valid interpretation without dialogue, and why the dreamer must have the final say. What “clicks” for the dreamer is “right”—but only for the moment, because subsequent events and later dreams often throw new light on previous interpretations.